Do you want to entertain children under age six? This is the DVD for you! 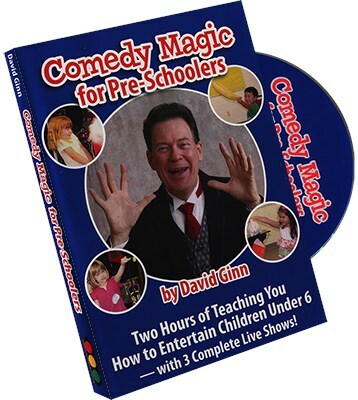 After 25 years of doing nearly 50 pre-school shows, magician/ author David Ginn finally shares what really works. He'll teach you how to seat the children, comedy warm-ups, pacing the show, openings and closings, using puppets and live rabbits, the "on your back" technique, toys & games & animals, time limits, an easy stage set-up, and much more in a 30 minute tutorial. Magician Mark Tripp says: "That easy stage set-up is one of the best ideas I've ever seen!" Watching this DVD is like getting a crash course on working with children under the age of six.